This is, surely, the most golden brown entry I’ll ever post. Look at that fried-ness up there. Look at it. It’s everything you associate with the word “nugget” as it is applied to food. I first had these lil guys at Whole Foods where they sell them by the pound in the lunch-y buffet area. They call them Chicken Fried Tofu and they’re chicken-fried tasty. They are also $7.99 a pound. I KNOW. For fried tofu. Highway robbery. I made note of the identifying tag on the hot bar that lists the ingredients. It was surprisingly short which made searching for the inspiration (…or knock-off) recipe kind of easy yet kind of hard. Easy in that it didn’t take long to identify a recipe as being not it. Like say it included buttermilk or corn flakes for instance. Not it! Hard in that it took a long time to find one that *was* it. But I found it! Thanks, internet. I’m not a fryer. I kind of stink at it. Inevitably I over heat the oil, it starts to let off clouds of smoke, the smoke alarm, being sensitive to things like, you know, smoke, goes off. I frantically open windows, take the pan off the heat, use a magazine to fan the alarm. Cat goes crazy. Guests wonder what in the world they’re in for. You get the picture and it isn’t a pretty one. But these are so good (coupled with so expensive at the WF) I had almost no choice. You see, the nuggets, they called to me. Here is what I learned about oil. Start on a medium low heat and pretty much keep it there. It took a few minutes for the oil to heat up (this is different from other times where it reached lava-like temperatures in a minute or less) and it stayed sizzling at a medium-low flame or about a 4.5 on an electric range. I judged it was time to start breading and frying when water flicked from my fingertips into the pan sizzled fast and furious. Other tips: 1) Press the tofu for best results. The longer you can do this, the better. 2) I suspect pressing the tofu, then freezing it, THEN thawing it and making this might be the best of the best, but I haven’t tried that yet. If you do, let me know! 3) Soak the pressed, sliced tofu for as long as you can stand. Over night would be great. And 4) If using bouillon cubes or paste, double the strength of the broth. 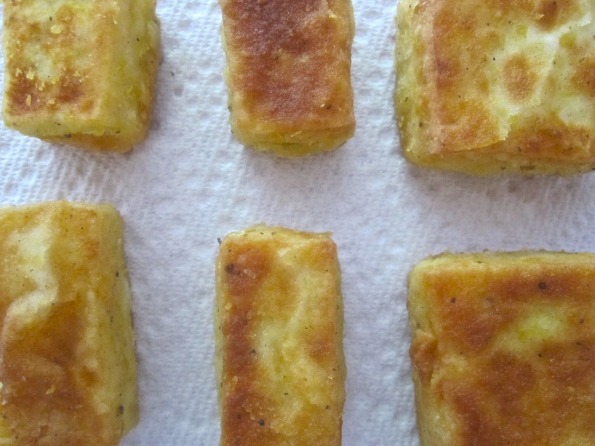 Cut pressed tofu into 1/2-inch thick slices; then cut into desired shapes. I did some squares, some tinier rectangles, all worked well. Place tofu into a shallow pan, and pour broth over the top, making sure tofu is covered. Set aside to soak overnight (or for at least an hour), refrigerated. When tofu has marinaded, stir together flour, yeast, salt, pepper, and spices. Warm oil in large skillet over medium-low heat. Remove tofu from broth and transfer to breading, one at a time. Pat breading onto tofu, you can repeat this twice (quick dunk of breaded tofu into broth, second layer of breading — I don’t think it needs it but you might!) 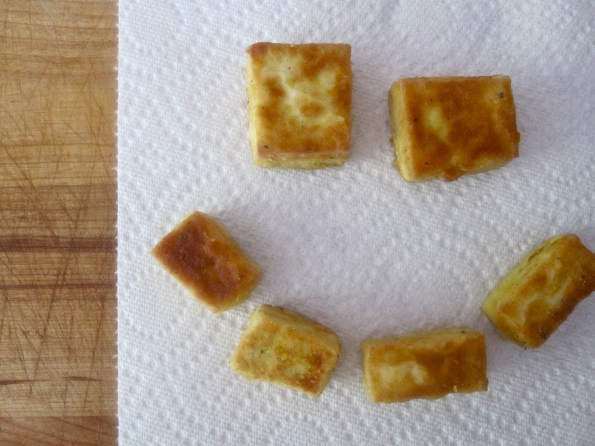 Gently place tofu in hot oil; fry until crisp and browned on all sides. Each side took about 2-3 minutes. Remove from oil and set on wire rack with paper towels underneath to catch any drips. They are best served immediately, but my love of cold tofu made them just as tasty the next day right out of the refrigerator. You can reheat the nuggets in a 400º toaster oven or conventional oven for 15 minutes until hot and crispy, too. This entry was written by haikugirl, posted on August 9, 2010 at 12:12 pm, filed under Tofu, Vegan Friendly. Bookmark the permalink. Follow any comments here with the RSS feed for this post. Post a comment or leave a trackback: Trackback URL. MMm, I love frying tofu. It’s the best way to cook it for sure! Hi Suzanne — you’re welcome! I tasted these at whole paycheck over the weekend and was completely hooked – hence searching online now for others who might have clues to make them. The woman behind the counter mentioned that they season them first and let them sit in the seasoning overnight. This apparently aids in pulling out some of the moisture before frying them. Thanks for playing with the recipe. I’m going to try it soon! Excellent tips! I’m going to try that next time I make them. So good! YAH!!!!!!!!!!!! I’ve never cared for tofu… but I’ve been giving it a chance as of late. I tried this stuff on the WF bar last night… It … was… AMAZING!!!!!!!!!! Thank you so much!!! There’s a block just begging for this preparation in my fridge right now…. These are great, right? Love them so much. Thanks to whomever at Whole Foods came up with this because it’s awesome. Shared this awesome recipe with my meat-eating friends. Everyone loves this!